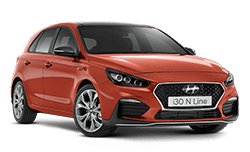 ~$20,990 drive away campaign price applies to PD i30 Go 2.0 Petrol Manual model only. $22,990 drive away campaign price applies to PD i30 Active 2.0 Petrol Manual model only. All cars must be ordered & delivered between 1st April 2018 and 30th April 2018. Driveaway price includes the recommended retail price, 12 months registration, compulsory third party insurance, dealer delivery change and stamp duty. Offer valid whilst stocks last and excludes govt, fleet and rental buyers. Hyundai reserves the right to change, supersede or extend these offers at its discretion. Metallic and Mica paint are optional extras and are an additional cost. See your participating Hyundai dealer for details. ^Calculated at RRP including fitment and is applicable to 2017 production only. Dealers will not substitute the offer with another offer. 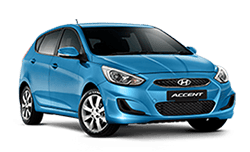 ~$16,990 drive away campaign price applies to Accent Sport Hatch Petrol 1.6 Automatic model only. All cars must be ordered & delivered between 1st April 2018 and 30th April 2018 . Driveaway price includes the recommended retail price, 12 months registration, compulsory third party insurance, dealer delivery change and stamp duty. Offer valid whilst stocks last and excludes govt, fleet and rental buyers. Hyundai reserves the right to change, supersede or extend these offers at its discretion. Metallic and Mica paint are optional extras and are an additional cost. See your participating Hyundai dealer for details. ~$27,990 drive away campaign price applies to Tucson Active 2.0 Petrol Manual model only. $29,990 drive away campaign price applies to Tucson Active 2.0 Petrol Automatic model only. $36,250 drive away campaign price applies to Tucson Elite 2.0 Petrol Automatic model only. $45,450 drive away campaign price applies to Tucson Highlander 1.6T Petrol Automatic model only. All cars must be ordered & delivered between 1st April 2018 and 30th April 2018. Driveaway price includes the recommended retail price, 12 months registration, compulsory third party insurance, dealer delivery change and stamp duty. Hyundai reserves the right to change, supersede or extend these offers at its discretion. Metallic and Mica paint are optional extras and are an additional cost. See your participating Hyundai dealer for details. ^Calculated at RRP including fitment and is applicable to 2017 production only. Dealers will not substitute the offer with another offer. Offer valid whilst stocks last and excludes govt, fleet and rental buyers. ~$26,990 drive away campaign price applies to Kona Active 2.0 Petrol Automatic model only. All cars must be ordered & delivered between 1st April 2018 and 30th April 2018 . Driveaway price includes the recommended retail price, 12 months registration, compulsory third party insurance, dealer delivery change and stamp duty. Hyundai reserves the right to change, supersede or extend these offers at its discretion. Metallic and Mica paint are optional extras and are an additional cost. See your participating Hyundai dealer for details. +Finance to approved applicants (excludes Government, Rental and Large Fleet Buyers). Finance offer applies to all Kona models. 1.1% P.A. comparison rate is based on a 5 year secured consumer fixed rate loan of $30,000. WARNING: This comparison rate is true only for the examples given and may not include all fees and charges. Different terms, fees or other loan amounts might result in a different comparison rate. Credit Criteria, fees, charges, terms and conditions apply. Maximum finance term of 4 years with a minimum 20% deposit required. Finance applications must be approved and settled by 30/04/18. Finance provided by St. George Bank - A Division of Westpac Banking Corporation ABN 33 007 457 141 AFSL and Australian Credit Licence 233714. Offer valid while stocks last and excludes govt, fleet and rental buyers. ^Calculated at RRP including fitment and is applicable to 2017 production only. Dealers will not substitute the offer with another offer. Offer valid whilst stocks last and excludes govt, fleet and rental buyers. Hyundai reserves the right to change, supersede or extend these offers at its discretion. Metallic and Mica paint are optional extras and are an additional cost. See your participating Hyundai dealer for details. 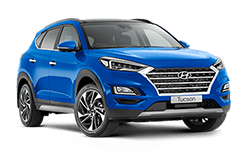 ~$40,990 drive away campaign applies to Santa Fe DM5 Active 2.4 Petrol 4WD Automatic model and Santa Fe DM5 Active X 3.3 Petrol 4WD Automatic model. All cars must be ordered and delivered between 1st April 2018 and 30th April 2018. Drive away price includes the recommended retail price, 12 months registration, compulsory third party insurance, dealer delivery change and stamp duty. Offer valid whilst stocks last and excludes govt, fleet and rental buyers. Hyundai reserves the right to change, supersede or extend these offers at its discretion. Metallic and Mica paint are optional extras and are an additional cost. See your participating Hyundai dealer for details. +Finance to approved applicants (excludes Government, Rental and Large Fleet Buyers). 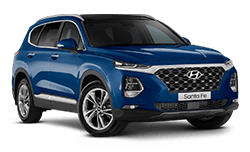 Finance offer applies to all Santa Fe models. 1.1% P.A. comparison rate is based on a 5 year secured consumer fixed rate loan of $30,000. WARNING: This comparison rate is true only for the examples given and may not include all fees and charges. Different terms, fees or other loan amounts might result in a different comparison rate. Credit Criteria, fees, charges, terms and conditions apply. Maximum finance term of 3 years with a minimum 20% deposit required. Finance applications must be approved and settled by 31/03/18. Finance provided by St. George Bank - A Division of Westpac Banking Corporation ABN 33 007 457 141 AFSL and Australian Credit Licence 233714. Offer valid while stocks last and excludes govt, fleet and rental buyers. Hyundai reserves the right to change, supersede or extend these offers at its discretion. Metallic and Mica paint are optional extras and are an additional cost. See your participating Hyundai dealer for details. 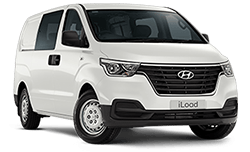 ~$36,490 drive away campaign price applies to iLoad 3 seat lift back 2.5 Diesel Manual models only. $38,490 drive away campaign price applies to iLoad 6 set lift back 2.5 Diesel Manual models only. All cars must be ordered & delivered between 1st April 2018 and 30th April 2018. Driveaway price includes the recommended retail price, 12 months registration, compulsory third party insurance, dealer delivery change and stamp duty. Offer valid whilst stocks last and excludes govt, fleet and rental buyers. Hyundai reserves the right to change, supersede or extend these offers at its discretion. Metallic and Mica paint are optional extras and are an additional cost. See your participating Hyundai dealer for details. 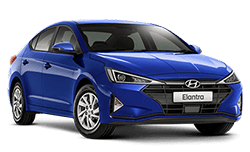 ~$20,990 drive away campaign price applies to Elantra AD Active 2.0 Petrol Manual model only. $24,990 drive away campaign price applies to Elantra AD Elite 2.0 Petrol Automatic model only. All cars must be ordered & delivered between 1st April 2018 and 30th April 2018. Driveaway price includes the recommended retail price, 12 months registration, compulsory third party insurance, dealer delivery change and stamp duty. Offer valid whilst stocks last and excludes govt, fleet and rental buyers. Hyundai reserves the right to change, supersede or extend these offers at its discretion. Metallic and Mica paint are optional extras and are an additional cost. See your participating Hyundai dealer for details. 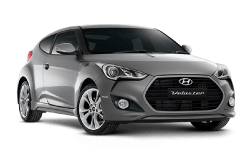 ~$29,590 drive away campaign price applies to FS5 Veloster 1.6 Petrol Manual model only. $33,150 drive away campaign price applies to SR Turbo 1.6 Petrol Automatic model only All cars must be ordered & delivered between 1st April 2018 and 30th April 2018. Driveaway price includes the recommended retail price, 12 months registration, compulsory third party insurance, dealer delivery change and stamp duty. Offer valid whilst stocks last and excludes govt, fleet and rental buyers. Hyundai reserves the right to change, supersede or extend these offers at its discretion. Metallic and Mica paint are optional extras and are an additional cost. See your participating Hyundai dealer for details. All cars must be ordered & delivered between 1st April 2018 and 30th April 2018 . 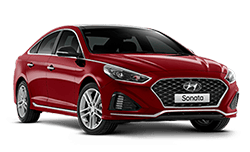 #Applies to all eligible Sonata models for the first 5 years/75,000km (5 years/50,000 km applies to eligible LF4 Sonata Premium models only) , whichever comes first. Eligible Sonata vehicles are entitled to free standard scheduled maintenance (i.e. logbook) services at participating authorised Hyundai dealers. Free scheduled maintenance services must be redeemed within specified service windows and are of limited scope. Terms, conditions & exclusions apply. Offer valid whilst stocks last and excludes govt, fleet and rental buyers. 15 year / unlimited Km warranty: applies to new passenger vehicles used for private / domestic purposes. Excludes vehicles used at any time for “commercial application” as defined in the vehicle warranty policy, for which a 5 year / 130,000km (whichever occurs first) warranty applies. Refer to full warranty terms and conditions for details and exclusions. #Applies to all i40models for the first 5 years/75,000km, whichever comes first. Eligible vehicles are entitled to free standard scheduled maintenance (i.e. logbook) services at participating authorised Hyundai dealers. Free scheduled maintenance services must be redeemed within specified service windows and are of limited scope. Terms, conditions & exclusions apply.Offer valid whilst stocks last and excludes govt, fleet and rental buyers. ^Calculated at RRP including fitment and is applicable to 2017 production only. Dealers will not substitute the offer with another offer. Hyundai reserves the right to change, supersede or extend these offers at its discretion. Metallic and Mica paint are optional extras and are an additional cost. See your participating Hyundai dealer for details. ~$44,990 drive away campaign price applies to iMax SLX 2.5 Diesel Automatic model only. All cars must be ordered & delivered between 1st April 2018 and 30th April 2018. Drive away price includes the recommended retail price, 12 months’ registration, compulsory third party insurance, dealer delivery charge and stamp duty. Hyundai reserves the right to change, supersede or extend these offers at its discretion. Metallic and Mica paint are optional extras and are an additional cost. See your participating Hyundai dealer for details. #Applies to all iMax models for the first 5 years/75,000km, whichever comes first. Eligible vehicles are entitled to free standard scheduled maintenance (i.e. logbook) services at participating authorised Hyundai dealers. Free scheduled maintenance services must be redeemed within specified service windows and are of limited scope. Terms, conditions & exclusions apply. Offer valid whilst stocks last and excludes govt, fleet and rental buyers. ^ Calculated at RRP including fitment and is applicable to 2017 production only. Dealers will not substitute the offer with another offer. All cars must be ordered & delivered between 1st April 2018 and 30th April 2018. 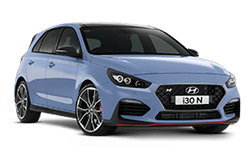 ~ Drive away price includes the recommended retail price, 12 months’ registration, compulsory third party insurance, dealer delivery charge and stamp duty. +Finance to approved applicants (excludes Government, Rental and Large Fleet Buyers). 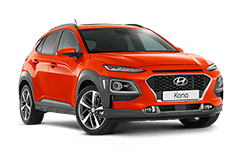 Finance offer applies to all Kona models with a maximum finance term of 4 years and minimum 20% deposit. Finance offer applies to all Santa Fe models with a maximum finance term of 3 years and minimum 20% deposit. 1.1% P.A. comparison rate is based on a 5 year secured consumer fixed rate loan of $30,000. WARNING: This comparison rate is true only for the examples given and may not include all fees and charges. Different terms, fees or other loan amounts might result in a different comparison rate. Credit criteria, fees, charges, terms and conditions apply. Finance applications must be approved and settled by 30/04/2018. Finance provided by St.George Bank – A Division of Westpac Banking Corporation ABN 33007457141 AFSL and Australian credit licence 233714. 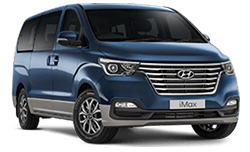 #Applies to all eligible i40, iMax, and Sonata models for the first 5 years/75,000km (5yrs/50,000km for LF4 Sonata Premium models), whichever comes first. Eligible vehicles are entitled to free standard scheduled maintenance (i.e. logbook) services at participating authorised Hyundai dealers. Free scheduled maintenance services must be redeemed within specified service windows and are of limited scope. Terms, conditions & exclusions apply. Offer valid whilst stocks last and excludes govt, fleet and rental buyers. Offer valid whilst stocks last and excludes govt, fleet and rental buyers. Hyundai reserves the right to change, supersede or extend these offers at its discretion. Metallic and Mica paint are optional extras and are an additional cost. See your participating Hyundai dealer for details.